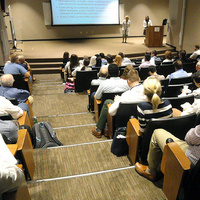 This lecture series is designed to meet the continuing medical educational needs of the University of Louisville medical faculty as well as trainees including students, residents and fellows in their clinical practice, research, and educational efforts. The series will also serve community doctors from private practices and affiliated hospitals as well as members of other health related programs at UofL, and other insititutions and health care facilities, including nurse practitioners and physician assistants. Our intended goal is that participants in our program will receive up-to-date information about evaluation and diagnosis, treatment modalities, and research about medical conditions that can be implemented during their daily practice with patients resulting in better patient outcomes, as well as teaching points in their educational settings with trainees. UofL medicine "Grand Rounds" "University of Louisville medicine"